Last week we discussed the cattle inventory report as a whole. This week, let’s dig into some of the state-by-state numbers. 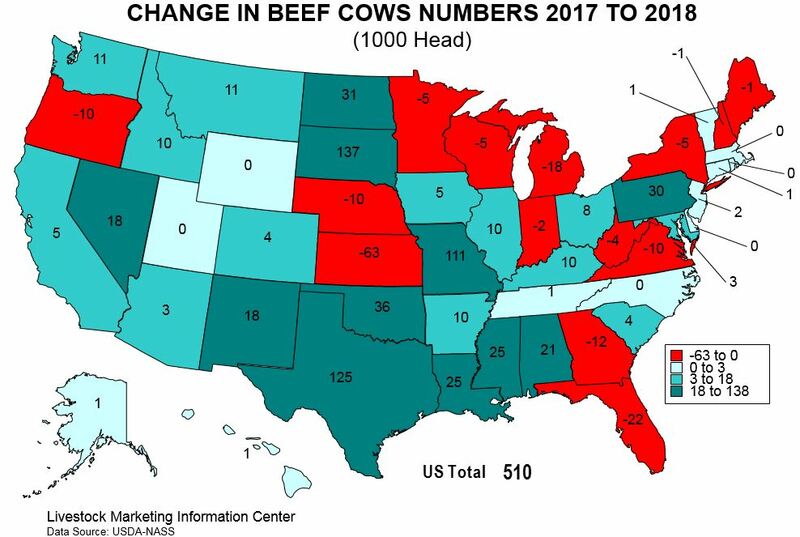 In the Southeast, all states other than Florida and Georgia saw an increase in the number of beef cows in their states. Mississippi was up 25,000 head and Alabama up 21,000 head of beef cows. Mississippi, Alabama, and Louisiana each increased their beef cow herds by a little over five percent as compared to January 1, 2017. Missouri increased the number of beef cows by 111,000 head – this is a 5.4 percent increase over last year. This moved Missouri slightly ahead of Oklahoma to once again rank as the second largest beef cow state in the country. Florida, long a top ten beef cow state, dropped to 13th place with 886 thousand head on January 1, 2018; behind Arkansas with 924 thousand head and Tennessee with 910 thousand head. This is the first time Florida has had fewer than 900 thousand head of beef cows since 1964. Texas had 125,000 head more beef cows this year than last. This is a 2.8 percent increase. While Texas had one of the largest increases this year, it is interesting to note that they are the state with perhaps the most room for further increases. Even with the recent increase, the number of beef cows in Texas is still 565,000 head lower than it was in 2008. In the northern plains states, drought conditions did not result in net herd liquidation year over year. South Dakota added the largest number of cows of any state in 2017. The beef cow herd in South Dakota increased 8.2 percent, to 1.8 million head. Beef replacement heifers in South Dakota were up 10.1 percent, suggesting that aggressive beef herd growth will continue in 2018. The beef cow inventory in Montana grew 0.7 percent to 1.5 million head while in North Dakota, the beef cow herd grew 3.2 percent to 985,000 head. This is the largest North Dakota beef herd level since 2002. The drought impacts show in the beef replacement heifers numbers in both states — 8.2 percent smaller in Montana and 7.3 percent smaller in North Dakota. This probably indicates lower growth potential in 2018 in these states. Next PostNext Do We Really Have a Cattle Shortage? Not Really. Dermot Gilley on Whither global warming?